Connective tissue proper: dense irregular. Atlas of Plant and Animal Histology. Cursor over the mouse to see where the image comes from. Organ: Tegument, dermis of the skin, irregular connective tissue. 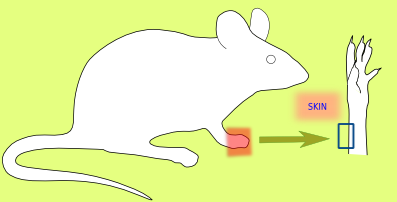 Species: mouse (Mus musculus; mammal). Technique: 8 µm thick paraffin sections stained with Masson's trichrome stain. This type of tissue is mainly composed of intertwined collagen fibers, which occupy most of the volume. The thickness and the high density of collagen fibers leave little room for fibroblasts. It also contains dispersed elastic fibers. 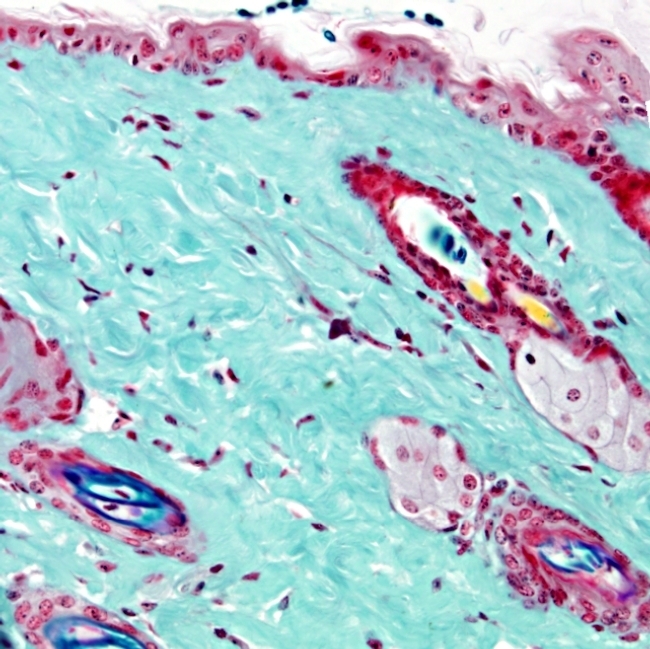 The dense irregular connective tissue can be observed in the dermis, in capsules of organs such as the spleen, liver, and those surrounding lymphatic ganglia. It is also present in other locations such as the cerebral dura mater, sheaths of larger nerves and tunica albuginea of testis.